Steven Tyler. Photo: Zack Whitford. 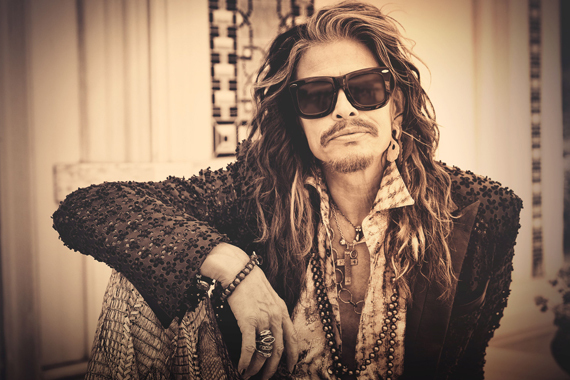 Legendary Aerosmith member and budding country music artist Steven Tyler will give a live performance on Thursday, Sept. 10 at the Melrose Ballroom in Long Island City, New York for an exclusive Front and Center public television episode. Set to air in early 2016, the acoustic event is part of the Country Music Association’s (CMA) Songwriters Series additionally featuring hit songwriters Rebecca Lynn Howard, Eric Paslay, Lindsey Lee, Nuno Bettencourt, and Marti Frederiksen. Tyler and his guests will perform stripped down versions of songs from his forthcoming Dot Records country album, including lead single “Love Is Your Name,” along with his mega-hits from Aerosmith. Together, Tyler and Aerosmith have nine No. 1 hits including “I Don’t Want To Miss A Thing” in addition to co-written titles “Jaded,” “Cryin’,” and “Livin’ On the Edge.” They have sold more than 150 million records worldwide that have included 18 platinum and 12 multi-platinum album certifications. He has won four Grammy Awards, an Emmy Award, and was inducted into the Rock & Roll Hall of Fame in 2001. In 2013, Tyler was awarded with the Founder’s Award at the ASCAP Pop Awards and was inducted into the Songwriter’s Hall of Fame. Tyler and Aerosmith recently finished their North America Blue Army tour. Tickets for the Front and Center taping are available from $95-$150. In advance of his taping, Tyler will be a part of a CMA’s reveal of final nominees for its annual awards. He will also perform at the Pilgrimage Festival in Franklin, Tenn. on Sunday, Sept. 27.